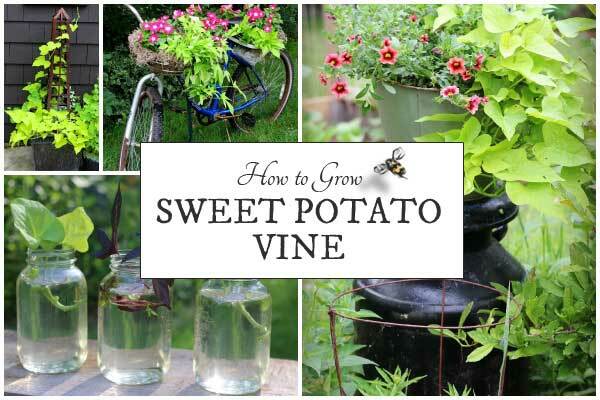 Sweet potato vine is easy to grow. 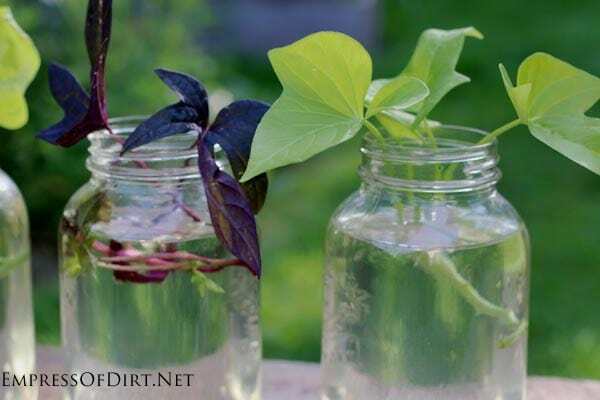 You can start a sweet potato vine from cuttings using this easy method as it grows roots in water. You can also grow clematis and honeysuckle vines from cuttings and more help for growing from seeds and cuttings. 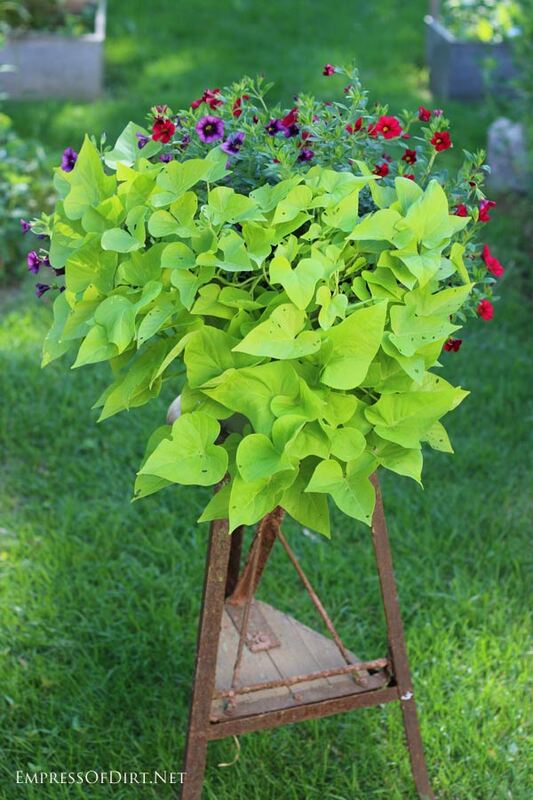 Ornamental sweet potato vine never goes out of style. 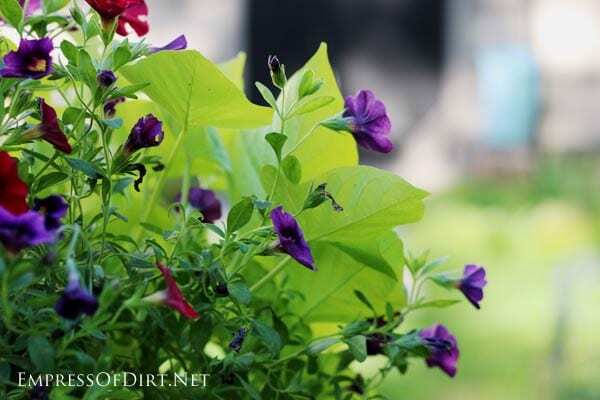 It’s bright, beautiful, fast-growing, and adds a punch of cheer to any garden container. 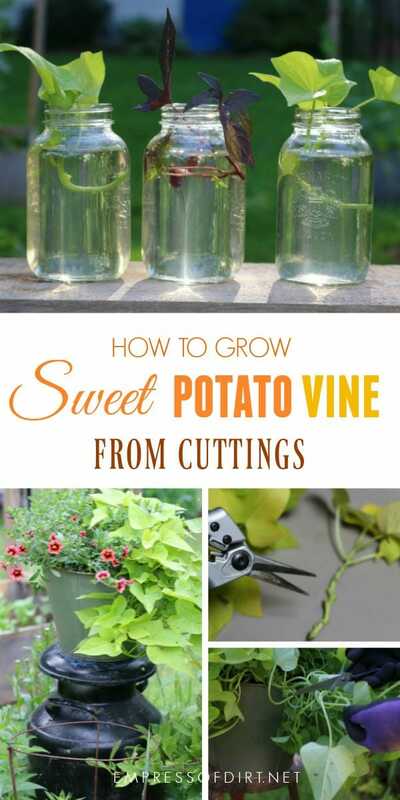 And better yet, it’s easy to grow more from cuttings. 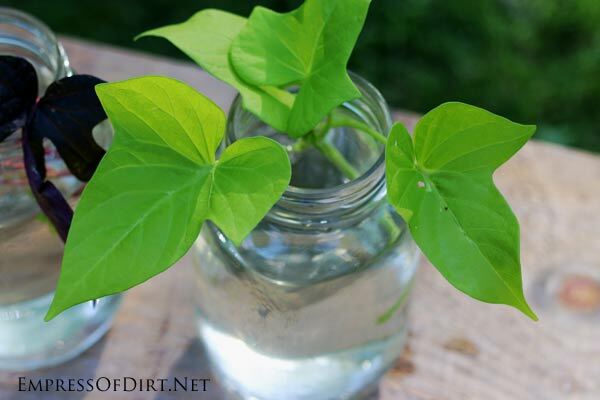 This easy-going plant can grow in soil or water so your options are wide open. You can also use it as a houseplant, though it can be attractive to various pesky flies that hold parties indoors, so beware of that. 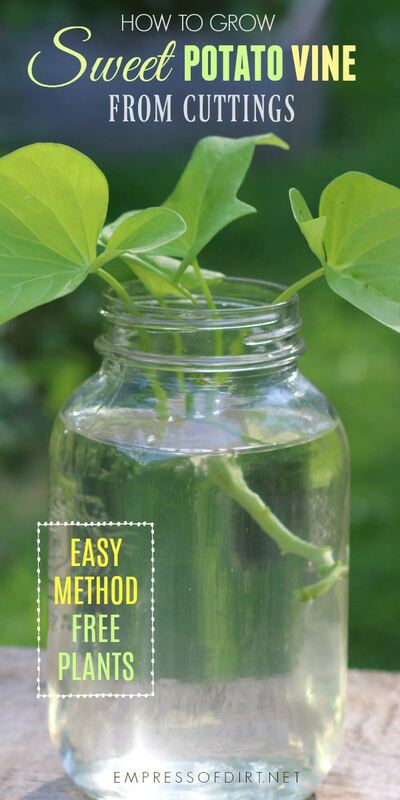 I’ll show you how I propagate it in jars of water. Some product links may go to affiliate accounts like Amazon.com but I always suggest you check your own cupboards first or buy locally. Ornamental sweet potato vine (lime green is the most common colour but also check for the darker varieties too). Scissors (clean with rubbing alcohol, bleach (1 part bleach:9 parts water) or your favourite garden-friendly disinfectant). Jars or vases with warm water. What is a leaf node? It’s the location on the plant where a leaf grows out of the main stem. When leaves are removed, roots can grow in their place. Cool, right? Okay, well, I think so. 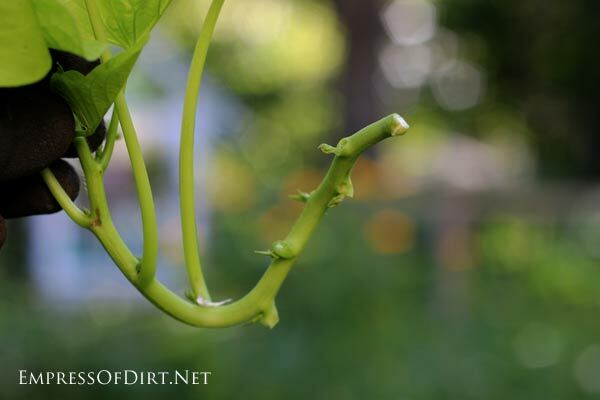 I like to have about 6-8″ of vine to use for a cutting. Using clean scissors (I keep rubbing alcohol handy), clip off a piece of vine just below a leaf node. You’ll actually most likely get new roots at every leaf node in the water jar. See all the leaf node stubs in the image (above)? I’ve removed the leaves to expose the entire section that will sit in water. New roots will form at those nodes. If you submerge the leaves in water, they will rot. You don’t want that. Warm water is a key to successful gardening. Plant roots do not like the cold the same way we don’t like cold feet. I keep the jars in a slightly shaded area. They don’t need a lot of sun and you don’t ever want the water evaporating and exposing the roots. After a week or so, you’ll see white roots start to form at the former leaf node locations. 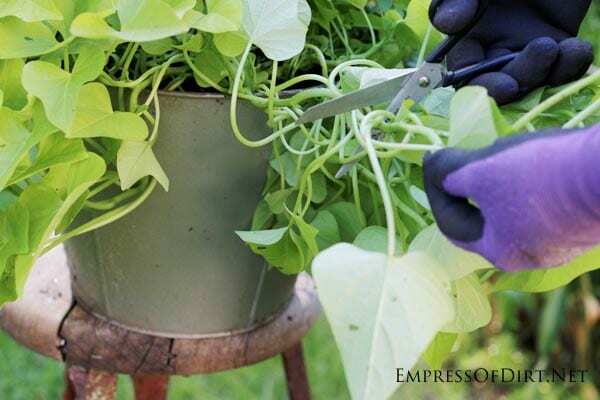 Some sweet potato vines grow really fast—with tons of roots—and others take their sweet time. Either way, it’s a tough plant to kill. And I hope I didn’t just jinx your efforts by saying that. You don’t want the water getting gross or murky so keep it fresh. You can use the old water to water other garden plants. You might notice the remaining leaves wilt slightly for a few days. Don’t panic. They should get perky again soon. 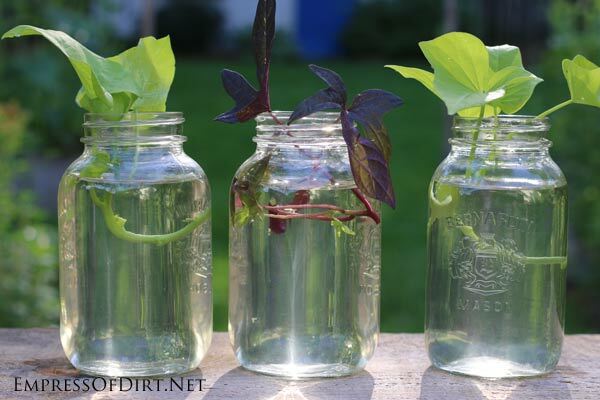 When the roots are at least 3″ long, you can plant your vines in containers or continue growing them in jars. Various insects will nibble on the leaves but it’s rarely tragic. You can see tiny bite marks in the image below. No big deal. They seem to nip and run. Related: How to grow succulents from leaves and cuttings. As mentioned, you can bring the cuttings indoors and keep them going all winter long (either in containers with proper container mix) or in water jars or vases. The whiteflies (and their buddies) may show up though. Because I grow other plants indoors (including vegetables), I keep a fan near my growing area and that helps blow them away. Where they go, I don’t know, but they can’t bother the plants when they can’t get to them. You could also overwinter them in a greenhouse but be careful to keep them in non-breakable containers. If the water freezes, the plants will probably die and the jars may break. I hope you’ll give this a try. It’s a super fast way to get more plants from the purchase of just a few! What Else Can You Grow From Cuttings? 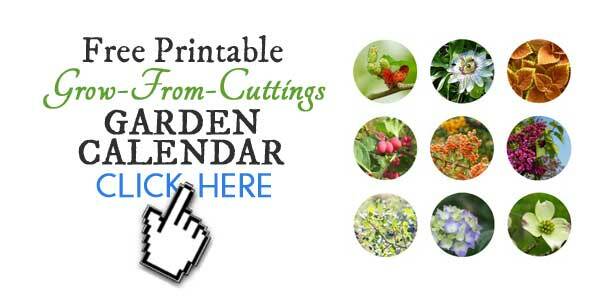 List of plants you can grow from cuttings in spring, summer, and fall. 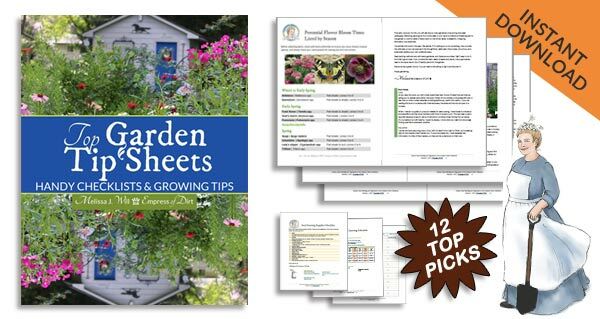 The 12 most popular garden tip sheets and checklists. Good day, I started two black sweet potato cuttings. I had nice root growth after a month in water and then planted them in soil I did not however, make sure they were a leader branch as I did with the green vine. So I have two nice “single” leaf plants going. I can see the roots which have reached the bottom of the container, I can see them as the container with soil is clear. My question is; will the top ever grow additional leaves? Have I made an error? The green clippings have already grown quite a bit and I have since taken another cutting from those. Help. Sorry, I don’t have experience with this to know. Are they getting too much sun? Could just be too much sun. Remove all dead parts and keep in filtered light. Had success last year with propogation of the vines from a “mama” plant. I am currently trying to grow from sweet potatoes, they have roots but no leaves / shoots yet. Any suggestions? Hi Nakita, I haven’t tried it but if I’m remembering right, you have to plant the rooted sweet potato in soil and allow time for it to send shoots up above the soil. Those shoots (or slips, as they are called) can then be propagated. Can I use normal potato instead of sweet potato? My Sweet Potato Vine, got a few flowers this year. They are pink,similar to a petunia. Have you seen this? Yes, I was taking care of a friend’s indoor sweet potato vines this summer and they were covered in blooms. sweet potato from the greengrocer. Cut it in half and stuck both halves into a hanging basket and in a couple of weeks had multiple shoots. So easy! Did you stick them in water or soil??? Hi Lilly, Water– as shown in the photos in this post.